Definition at line 24 of file DelayTagged.h. Definition at line 26 of file DelayTagged.h. Definition at line 127 of file DelayTagged.cc. Definition at line 132 of file DelayTagged.cc. Definition at line 138 of file DelayTagged.cc. References SQUIDSTRINGPH, SQUIDSTRINGPRINT, DelayBucket::stats(), storeAppendPrintf(), tag, and theBucket. Definition at line 35 of file DelayTagged.h. Referenced by DelayTaggedCmp(), and stats(). Definition at line 34 of file DelayTagged.h. 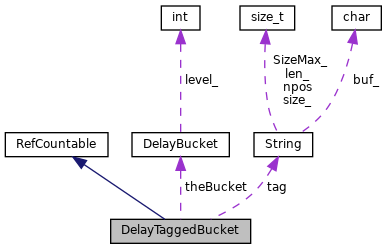 Referenced by DelayTagged::Id::bytesIn(), DelayTagged::Id::bytesWanted(), DelayTagged::Id::Id(), and stats().